ISLAMABAD – Dr Naeem Taj, a surgeon of the Capital Hospital CDA, has earned fame and prestige for the nation by gaining entry into the Guinness Book of World Record by removing 25.5 cm long gallbladder through 1 cm incision. Dr Naeem after operating 70-year-old patient Rasheeda Bibi at CDA hospital removed 25.5cm long gallbladder from her body. This is the longest ever gallbladder removed laparoscopically in medical history. 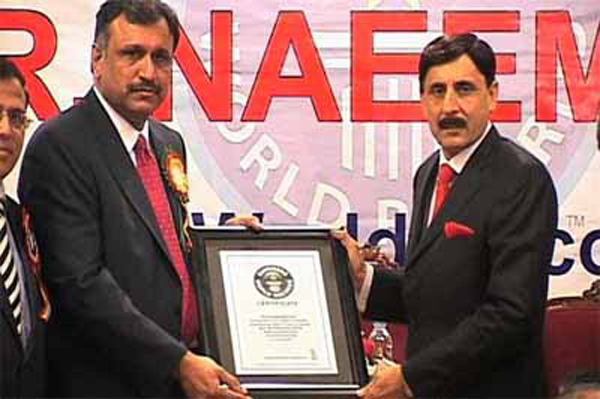 Guinness Book of World record has awarded Dr Naeem Taj of CDA with the certificate of “world’s longest gallbladder removed through laparoscopy”.